June 19 is National Martini Day. Today all adults can gather together and enjoy their favorite martinis as a part of celebration. 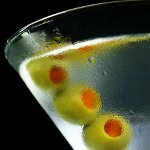 There are several claims about invention of martini. The earliest legend says that this invention belongs to a San Francisco bar owner Professor Jerry Thomas. Around 1850 a miner offered his a nugget of gold to create a special drink for him. The miner was en route to Martinez, California, hence the name of the drink. The stronger claim of martini invention belongs to the city of Martinez itself. A bartender Julio Richelieu made the first martini. His recipe called for gin, sweet vermouth, bitters and an olive. Over time martini evolved into number of variations. The most popular are martini on the rocks and dirty martini. Martini on the rocks calls for ingredients to be poured over ice cubes and the drink is served in an old-fashioned glass. Dirty martini calls for a splash of olive juice or olive brine. It's typically garnished with an olive. No matter what is you favorite martini, enjoy it today to celebrate the holiday!